Sunshine and two days of glamour sailing conditions awaited the International Moth fleet in the English Riviera last weekend. 13 boats joined in battle and, for two of the boats, the Moth GP series itself depended on the outcome, with class newcomer Chris Rashley going up against old hand Simon Payne. 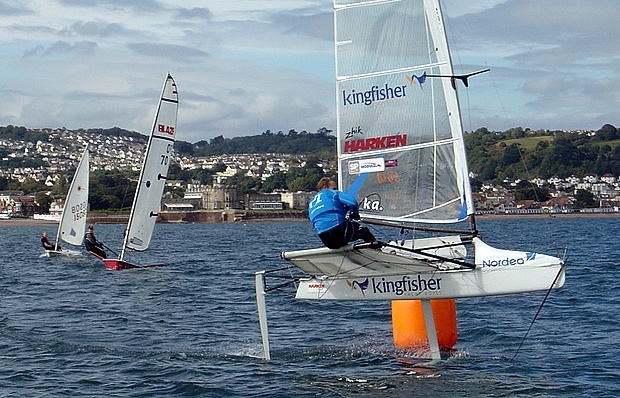 The first race started in slightly marginal foiling conditions and, after Simon made an early bid for freedom, first Chris and then Mike Cooke slowly overhauled him to take the top places. Races two and three were sailed in slightly more breeze, with Simon taking both from Chris. Mike was relegated to third with Tom Offer, Ben Paton and Andrew Friend rounding out the top half dozen. After a top chilli in the club, Ben Paton led the charge into Torbay to find himself some drinking games in an attempt to sabotage the fleet. His plan resulted in the wrong half of the fleet with sore heads in the morning and Simon and Chris continued their duel. Over another three tight races Simon took first blood with Chris fighting back in the second. This lead to a nailbiting finale with the potential for a tie should Rashley get the upper hand. Chris nailed the race, taking the event on countback and giving him the overall Slam GP series to boot. Enjoying the breezier conditions were Andrew Friend, Pete Barton and Mike Cooke who all scored third places over the course of the day and, with only 5 points separating 4th to 7th, every race counted. The next event for the Moth squadrons is the Hayling Island end of season event on 29-30 October, which will see the GP series prizegiving along with coaching from top Mothies.